What is a DIRECTV “Legacy” System? I guess it’s time to answer this question. It wasn’t too long ago that what we call “legacy” technology was the only technology used by DIRECTV, but the company has moved so far past that standard that it’s time to take a look back. When DIRECTV first started broadcasting in 1994, the system was pretty simple by today’s standards. One satellite, one frequency range. Installation was designed to be done by amateurs. Unfortunately, it became harder and harder to maintain that simple model because DIRECTV customers wanted more channels. This led first to additional satellite locations, requiring more complex dishes and more confusing setups, and then to a completely different frequency range to give DIRECTV room for thousands of DIRECTV channels blanketing the country not only with national networks but local channels as well. The original DIRECTV setup, believe it or not, was designed for a single TV. It wasn’t terribly hard to build in support for another TV, but once you got past two it got a little more complex. The satellite signals were (and still are) segregated into “odd” and “even” signals, which gives enough room on a single cable to carry the channels the user asks for. With more than two TVs, it became challenging to make sure that one user requesting an “odd” signal would not stop another user from requesting an “even” signal. A plain old splitter wouldn’t do the job. The answer was a multiswitch like the one you see at the top of the article. The one you see takes two frequency ranges, each with “odd” and “even” signals, and prepares them for distribution to up to 8 TVs. 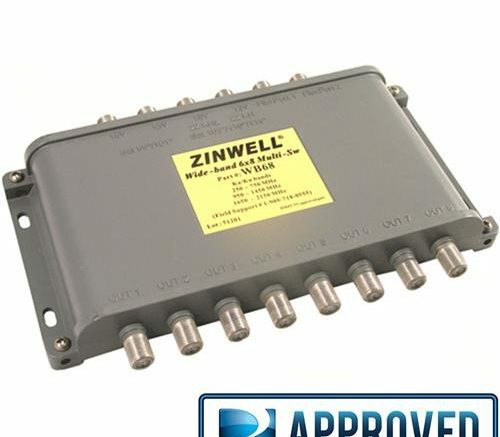 A multiswitch is different from a splitter because it’s always taking in all the available kinds of signals, so any receiver is free to request any signal type. This solves the problem of one receiver knocking another one out. Still, with this system, there was a weak point. Two of them, actually. First of all, this technology requires a wire from each TV to be run back to a central location. Even if you have two TVs next to each other, each needs a wire back to the multiswitch. The other issue is that each recording tuner needs its own wire. A DVR that can record two things at once needs two wires. That’s quite a burden to people who want to fish wires through the walls. That’s why in 2007 DIRECTV first unveiled SWM technology. SWM technology allows for a single wire to be split multiple times instead of your needing multiple wires. It also makes it possible for multiple tuners to travel on one wire. This isn’t an article about SWM technology, although if you search this blog you’ll find a lot of those. SInce 2009, it’s been the default for all DIRECTV installs and it’s required for all the new technologies like Genie and 4K. The older technology was called “legacy” technology and believe it or not people still use it, because it still works. You’re locked out of all the new stuff, but I guess there are still people who still like their TV watching experience to be simple. That’s ok too. Legacy technology is expected to be supported for years to come, as it’s still used in commercial and industrial installations and it’s the basis of RV and marine systems. So you don’t have to worry about being left out in the cold just yet.